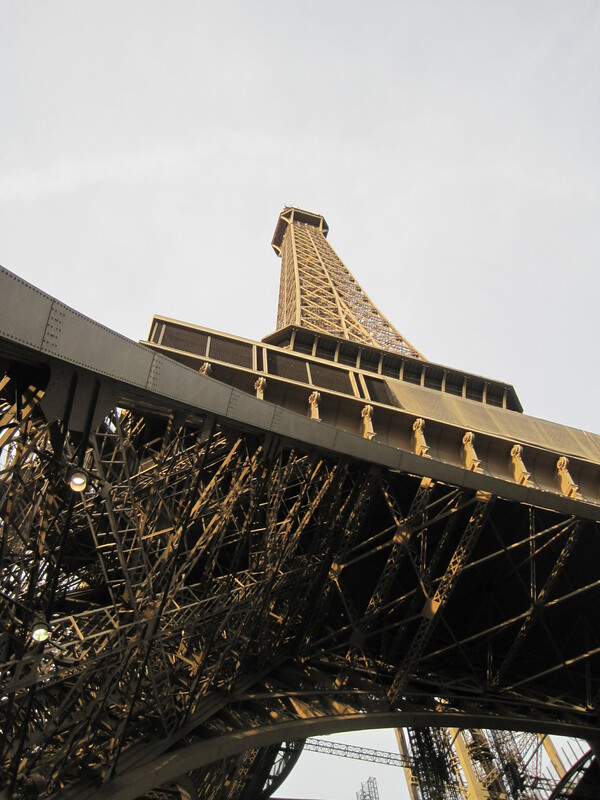 The Eiffel Tower has long been known as grand and romantic, a symbol of France. Back in college, I was astounded to learn that, having been commissioned for the 1889 World’s Fair, the tower had never been intended to remain. As seeing this legendary icon had become the top of my bucket list, I feared it could only disappoint. And then there it was. Big and majestic and beautiful and certainly no more than a twenty-minute walk from our current location. Little did we realize just how big the tower truly was. What looked so close was actually a good hour’s walk away. By the time we reached it, my feet were literally bleeding. One popped blister, two average-joe blisters, and one blood blister completely obliterated my ability to stand up long enough to take the iconic, long-distance photo of my dearly sought-after tower. So instead, as we half-teetered in line for the elevator, I snapped a photo upwards–catching the iron latticework in all of its true glory. And I realized that this was the photo I wanted. Not the photo the rest of the world would care about, perhaps, but the photo that would remind me of the hard, detailed, inspired work and the massive scale of my beloved tower. Then, together with my sister, I piled into two over-crowded elevators to get to the top of one of the world’s greatest structures. The view was breathtaking–whatever the guidebooks say. Before leaving for France people said all kinds of things. That the locals were rude, the sights overcrowded, the streets dirty, and the gelato good. I could have expected that France. Instead, I found my own France. Sidewalks with street-musicians. A collection of food trucks where we were the only foreigners. Locals down by the water playing hopscotch and strumming guitars. Streets far cleaner than New York City. Gorgeous architecture. Friendly people. A collection of shops and Starbucks and affordable eateries in my favorite neighborhood. And, yes, the gelato was good, but it was nothing compared to the fresh strawberries we bought on the Rue Cler. Paris became my own. I could have felt disappointment in missing my long-distance shot of Gustave Eiffel’s greatest feat. I could have felt disappointment in getting only one scoop of gelato. I could have fought for the Paris I had heard about. Instead, I found the Paris that mattered to me. The understandable tendency, when we miss out, is to feel disappointment, but the last few weeks have given me a different perspective. Of course, there is the part of me that wants to fight for the me that could have been without Lyme’s Disease: a fiddler, a missionary, a gymnast, a businesswoman… Instead, I have decided to revel in the me that is. Just as I chose to celebrate the close-up shot of the Eiffel Tower, I choose to celebrate the path I walk. It may not be the iconic life of our favorite characters on television, but it’s mine and it’s profoundly beautiful. Now, having set aside any kind of modern standard, I am thankful for the strange, yet powerful role I play in this world. As I continue to learn about myself, I have a new appreciation for the way God directed me. The passion developing for writing students, the creativity seeping out in play-dates with my nephews and in my novels, the true friendships now returning from across the globe… It’s all because my life didn’t go the way I wanted it to. Praise God for that. Sometimes you just need a change of perspective. What are your plans for this Memorial Day Weekend? Perhaps to spend time with family, avoid the rain by slipping into a movie theater, catch up on the housework, or maybe to cuddle up with a blanket and a cup of tea to write? I will be at the Maine Bible Quizzing Retreat in Winthrop so I am sure I will be thoroughly drenched come Monday. Since I will be away and you might be writing let me leave you with one last portion of writing aid. Perfectionism roams the world seeking to devour unwitting writers. Perfectionism not only gets you stuck in the mud, spinning your tires in a vain hope for escape, but it also vaporizes the joy of your craft. Don’t let it. Take a stand against perfectionism this weekend. It starts by letting other people–trusted friends or family members at first–read your work. You have to accept that you will never perfect your novel. You can grow it and shape it, but it will always be a product of a human and thereby faulty. You also cannot control what others will think about your work. Fifty people may like it; one may not. Perfectionism makes you hold onto the one negative comment until writing is a labor–not of love. Very often the difference between published (or self-published) authors and (unpublished) writers is the author’s willingness to look in the face of a novel, admit its faults, and love it enough to share it with the world anyway. “I know what it is to be in need, and I know what it is to have plenty. I have learned the secret of being content in any and every situation, whether well fed or hungry, whether living in plenty or in want. I can do all this through Him who gives me strength.” Philippians 4:12-13. See, my sister and I were just talking about this over the weekend. She reminded me that just because Paul was content did not mean he did not feel hungry. I think sometimes we believe that ‘contentment’ means not having any negative feelings like pain or loss or need. Truth is, those are parts of life. Contentment is something that lasts even through those. Truth be told, I paid a lot of lip-service to contentment in the past and I am just now figuring out what it really looks like. Relationships break; people die; bodies hurt; sickness comes; finances struggle… Falling in love, happens too; as do a number of other great things like making music, celebrating holidays with people you love, and seeing novels come to completion and be dearly loved by great fans (like you all). In the good and bad, contentment and peace are a choice. A choice that we are far better for making. A choice that I am striving to make more and more. As Josh Garrel’s song “Anchor of My Soul” goes, “I’ve seen enough to know that You’re love’s the only anchor for my soul.” That knowledge is where contentment comes from. I find it ironic that I am learning more about periods of time and religions from my ‘Intro to the Visual Arts’ class than I did from both of my Western Civ classes put together. I guess some things just work out that way. Learning about art and the other countries in the world will truly be an aid to me as I transition from books set in other universes to some novels set in my actual homeworld. Funny how going to college for business (which most people who know I’m a writer thought was strange) is actually helping me in my writing. God knows what He is doing. Quite honestly I’d rather write somebody a song on my guitar than a poem in a card, but either way, I’m normally a word-girl… after all, I am a writer. Words that people give me, stick. I have a collection of the cards that mean something hanging on my wall, scrapbooked or safely stored. But when it comes to giving words to others, I am not as skillful. Perhaps it is my understanding that there is always a better way to put something or my excessive need to edit, but cards are just not my thing. I try to give a gift so sentimental it takes just a few short, cute sentences to finish the warm and fuzzy thought train. Graduations abound around me, causing deja vu and a lot of hopefulness for the day I finally graduate college and put it behind me. Last night I attended a graduation party for two of my close friends and I was at a loss for the sentimental gift to offer. Graduations require special thought. It is the closing of a book of your life and the beginning of a new one. A simple blender will not do for a close friend’s graduation gift. I’ve got to say that creating the page made me feel all warm and fuzzy. Looking back at the memories and compiling them all together made the relationships stronger. It focused on the good; not the gaps. In a written book, there is good and bad, painful and happy, filler and adventure. And that’s all part of life, but some teenage girl books get so wrapped up in the ugly that there’s no room for the joy. That is the way we tend to think and it is those books we need to rally against! I think I love scrapbooking so much because it highlights all the best parts of life. We need more reminders of the good stuff. Like the new snazzy guitar I just bought… or swinging with my friend in the park last night until after it had closed… coming up with secret code words with her in case of emergency (at nineteen)… laughing about the stupid moments with old friends… or hanging with my nephews tonight. Life really does have its awful times. Lately they’ve been tough hurdles. But it also has its amazing, profound, simple wonderous moments. Maybe if we focused a little more on that our lives could be more like scrapbooks than stupid-girly-negative-novels.